KDE Telepathy 0.2 isn’t too far away, so I thought I’d give a bit of a progress update. Most anticipated of all, there is no longer a dependency on gnome-keyring! Upstream (telepathy) had provided a (mostly working) mechanism for us to provide our own passwords, so we have perfect KWallet integration. Over the sprint I implemented drag+drop on our contact applet plasmoid so they interact nicely with the contact list. We’ve made it even easier to see other contacts on your local network (bonjour) added auto away and “now playing” presence messages. There’s still a lot of things left to sort out, but 0.2 but it is shaping up to be a solid release! We’re about 1 week away from a hard feature freeze, aiming for a full release in early november. 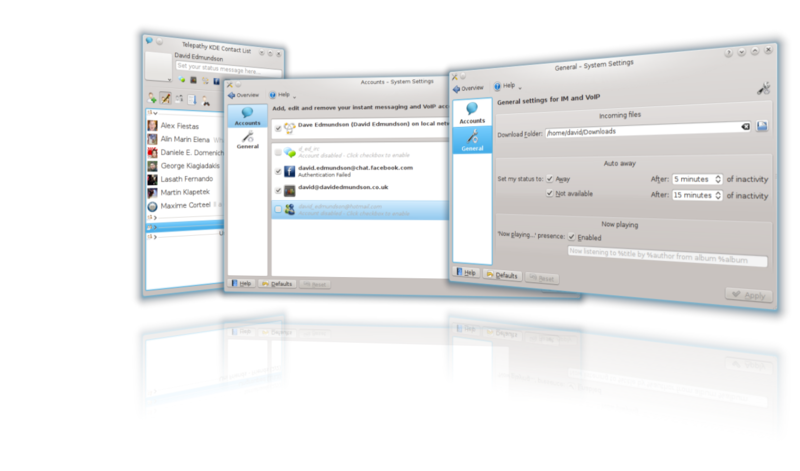 If you want to get involved, or start early beta testing please join us in #kde-telepathy. Now for some pics and videos! Most anticipated of all, there is no longer a dependency on gnome-keyring! Upstream (telepathy) had provided a mechanism for us to provide our own passwords, so we have perfect KWallet integration. We’ve made it even easier to see other contacts on your local network (bonjour) added auto away, and “now playing” presence messages. There’s still a lot of things left to sort out and I’m not finding much time for sleep :-), but 0.2 but it is shaping up to be a solid release! KDE Telepathy 0.2 Preview from David Edmundson on Vimeo.